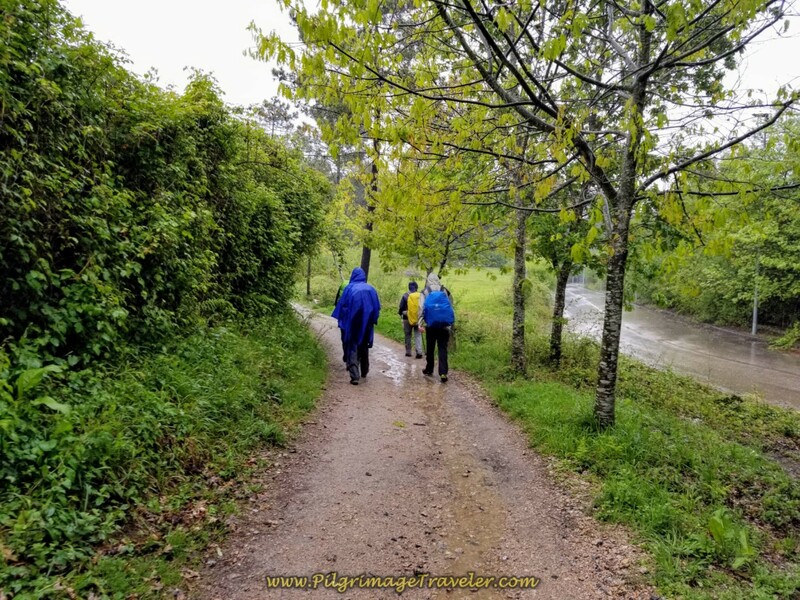 Day twenty-one on the Central Route of the Camino Portugués was a day for digging deeply into myself and my Camino experience. Team Magdalena did this day and day twenty all in one stage. It was an enormous effort for everyone and it rained almost the entire time, especially later in the day. This was the worst time it could have chosen to rain, in time for the steep hill ascent into and out of Mos. This day is also almost entirely on pavement, as you will see in the photos to follow. There was never a more appropriate Latin expression for this day, than the one the medieval pilgrims said to one another in passing to and from Santiago, in the quote below. Please consider your own desires, ability and stamina before choosing to do this entire stage in one day! Here is my personal Google map which I created from my uploaded GPS tracks. As usual you will find accommodations, cafés and supermarkets that I placed on the map for easy location. While I have taken literary license and split our one stage into two day's worth of articles (days twenty and twenty one), this map shows our entire route from Tui to Redondela. However, only the features for the second half of the day are included in the map, from O Porriño onward. You may refer to day twenty for information on the first half of this stage. If you are tech savvy, you may enlarge this map and download my GPS tracks for your own use if you so desire. Just click on the three dots in the upper right hand corner of the map. Here is our elevation profile for the entire stage from Tui to Redondela. The final 15 kilometers of this stage, covered in this article is about halfway through the profile below, and to the end. 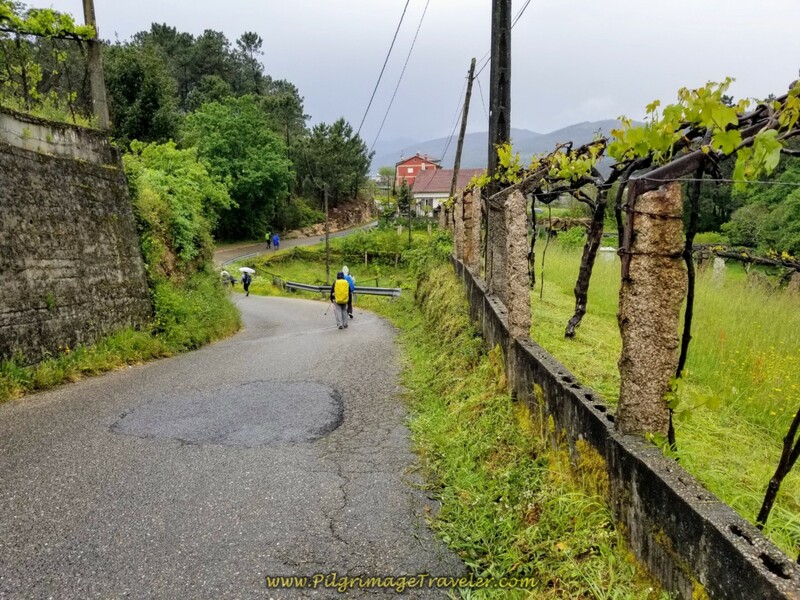 It includes the fabulous and steep climb to the Santiaguiño cross and the steep descent into Redondela. Please see day twenty for the first half of this stage. From the municipal albergue in O Porriño take the Avenida Buenos Aires eastward toward the center of town. In several hundred meters, cross the train tracks below and head into the center. A few meters onward, come to a roundabout, take the second left to head northward on the Rúa Raminranes. In 1/3 kilometer, come to another roundabout and join the N-550 as it continues north. About another 300 meters onward, come to the busy intersection with the A-52. Walk under the overpass on the walkway provided and turn immediately to the right, to see another underpass. Walk under it. It was here that Matt, Magdalena and Michal decided to stay on the N-550 all the way to Redondela, as a well-paved shortcut, avoiding the day's steep hill climb into Mos. Because the entire stage was so very long, it was the best choice for them all ~ definitely easier for a wheelchair as well. 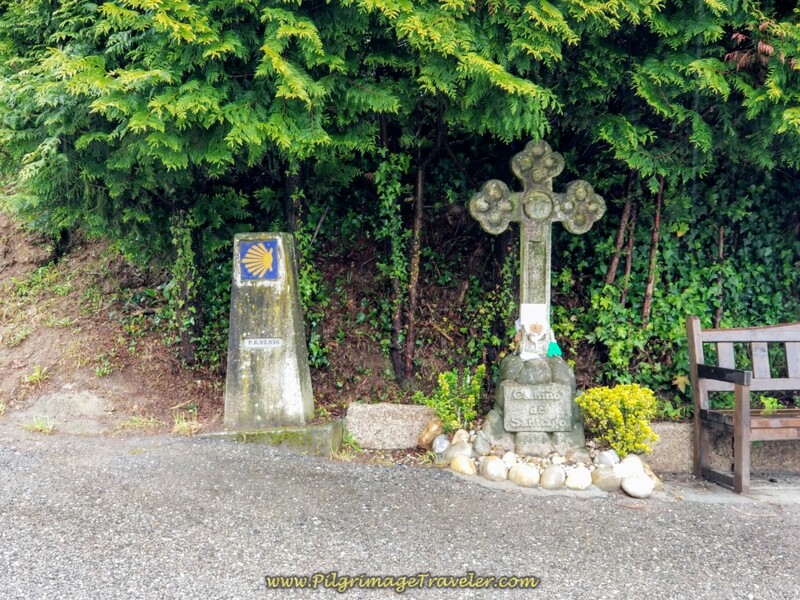 We said goodbye to them, hoping to meet up in Redondela on day twenty-one of the central route of the Portuguese Camino. 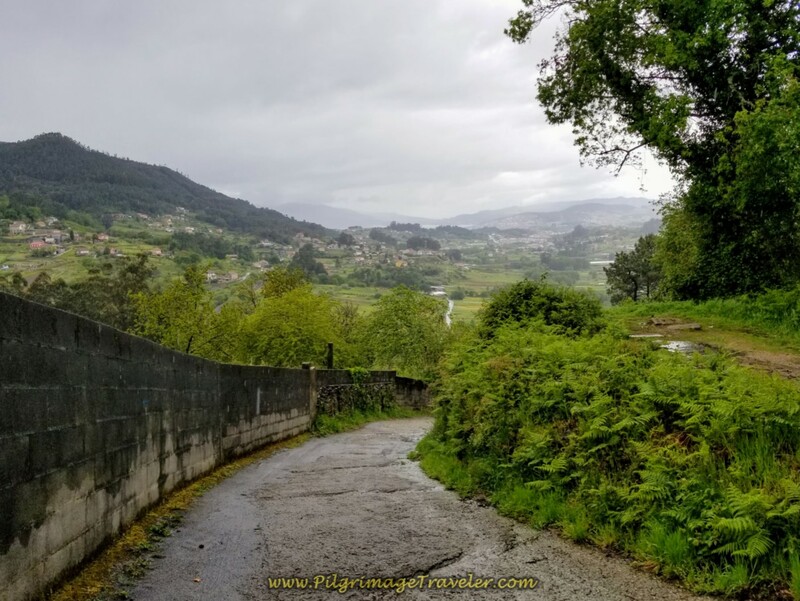 We turned left at the next intersection to join a quiet paved road that parallels the N-550, the Camiño Vello de Santiago as it travels northward, shown below. The municipality of Mos supplied these lovely signposts to guide the pilgrimage traveler through its district. Here is the first one that we encountered, below. 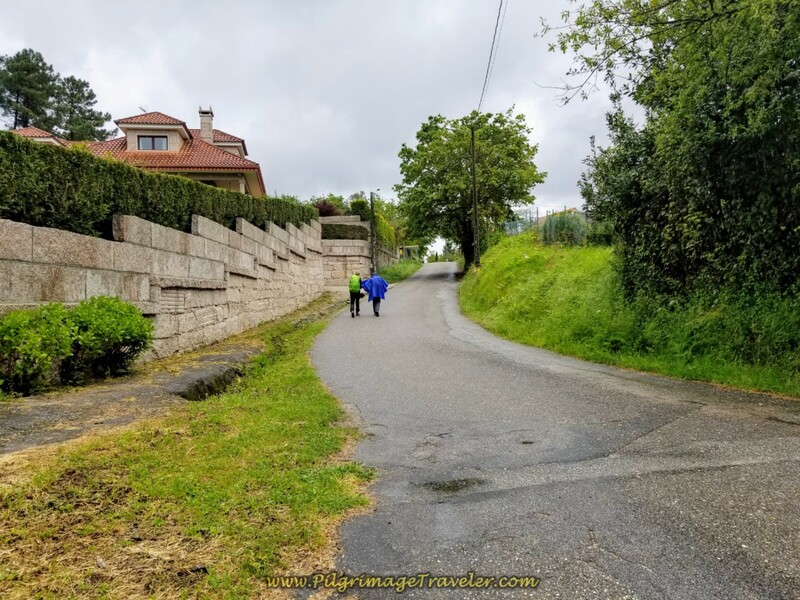 After 2/3 kilometer on the Camiño Vello de Santiago, you take a left hand turn, westward onto the Rúa da Quiringosta. Come to the N-550 and cross over it. Then, continue on this street for 1/2 kilometer, and follow the wooden signpost to turn right and northward, shown in the photo below. 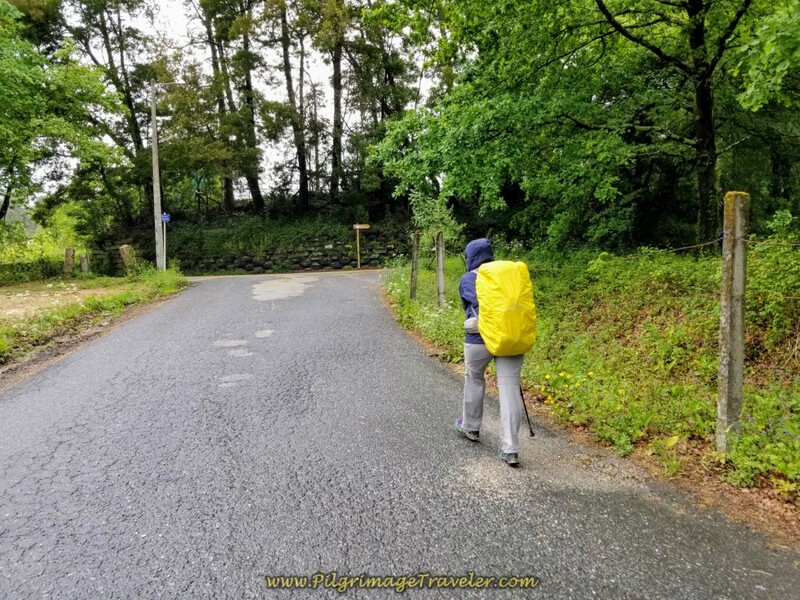 Here is Miriam walking on the quiet, paved side road, heading north through the countryside. 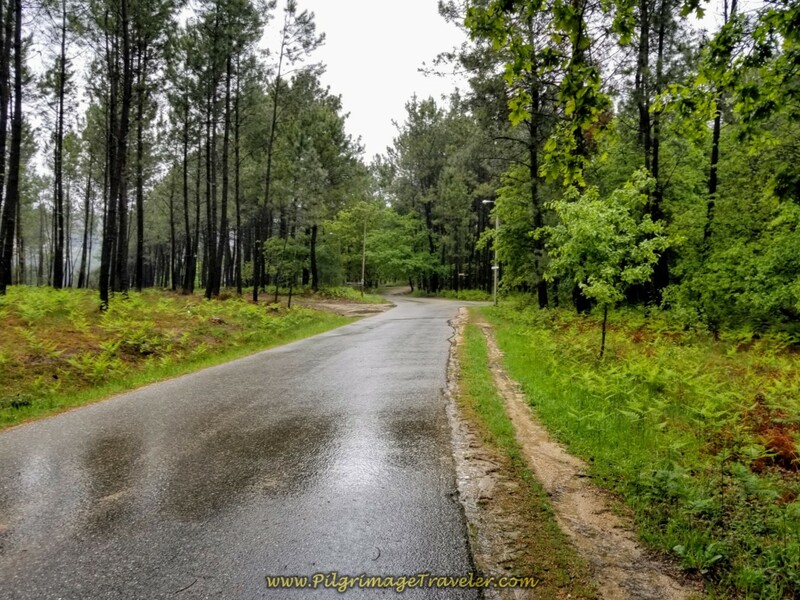 For the first 1/3 kilometer on this road, it is nice and flat, and then a steady incline begins, becoming ever steeper until the crest of this hill, shown here. Then the pilgrimage traveler gets a break on the brief downhill cruise. Enjoy it now while you can! There is a slight uphill towards the next town of Veigadaña. 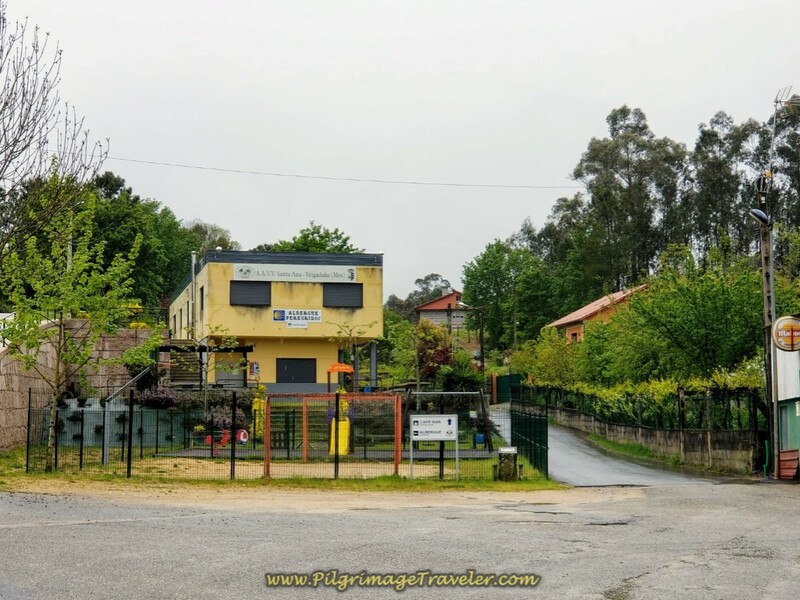 The Albergue Santa Ana de Veigadaña is 3/4 kilometer from the turn north, and about four total kilometers from O Porriño. Here is a photo of it. It would be a practical stage to extend your day from Tui to here, for a total of about 22 kilometers. 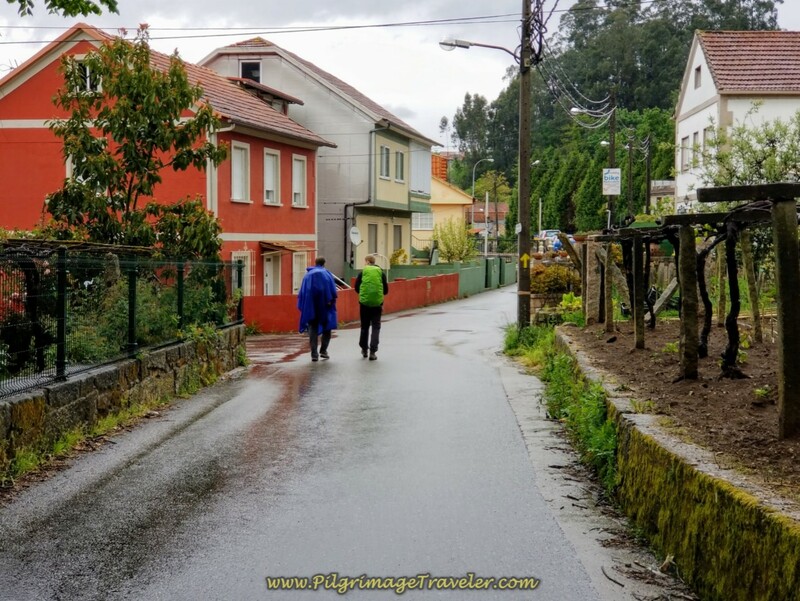 After the albergue, the street becomes the Camino das Lagoas, and actually heads down another hill for a brief period. 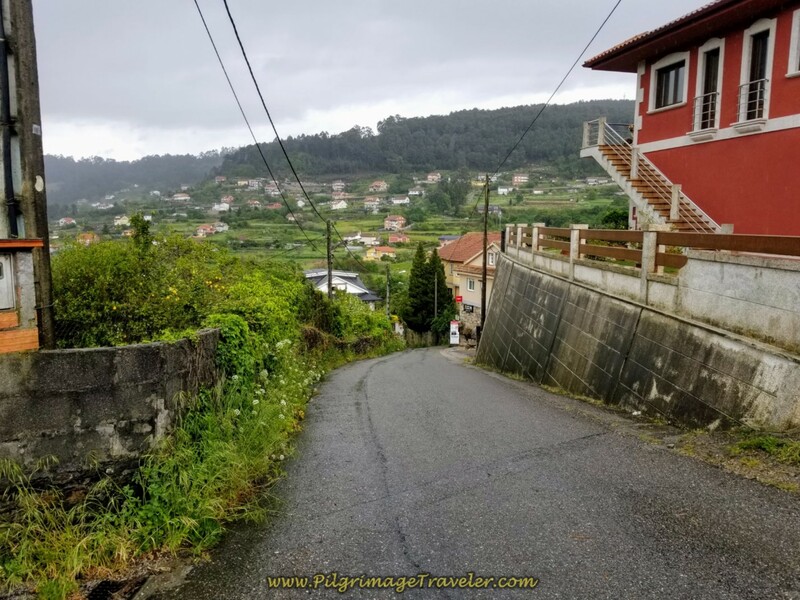 So it isn't all uphill on day twenty-one of the central route on the Portuguese Way! But then, the pilgrimage traveler begins a slow steady climb, though more countryside, following the wooden signposts towards the next town of Mos. The weather was turning worse. It was raining significantly again. The sidewalks begin as you enter the town of Mos. There is a wonderful rest stop, surrounded by blooming wisteria, that we took note of as we walked by. There is a picnic table and a water fountain to fill your water bottles. It was way too rainy for us to dally out of doors! It is 1.73 kilometers from the albergue in Veigadaña to this rest stop. About 1/2 kilometer after the rest area, you join the main road into Mos. If you turn left here, you will find an accommodation called A Casa Dos Parladoiros. 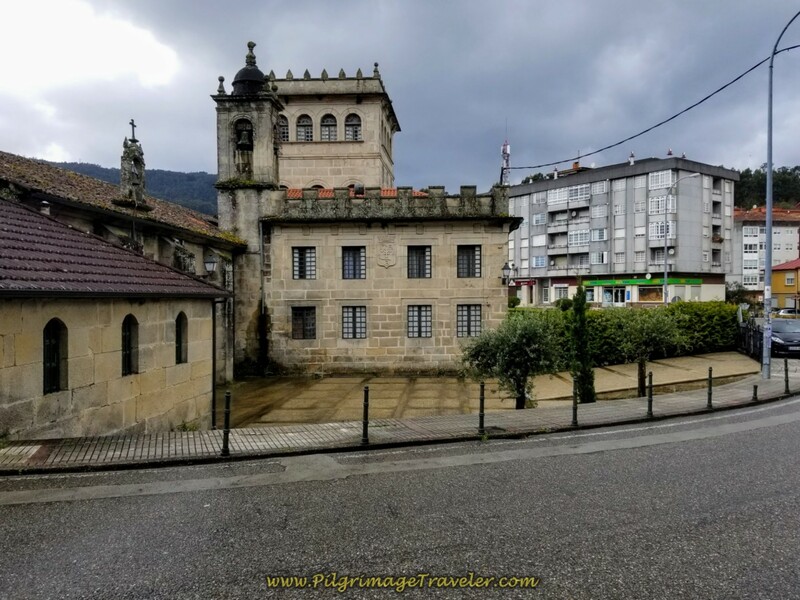 If you turn right and stay on the Camino you will walk into the main town area and towards the Albergue de Peregrinos Santa Baia de Mos. 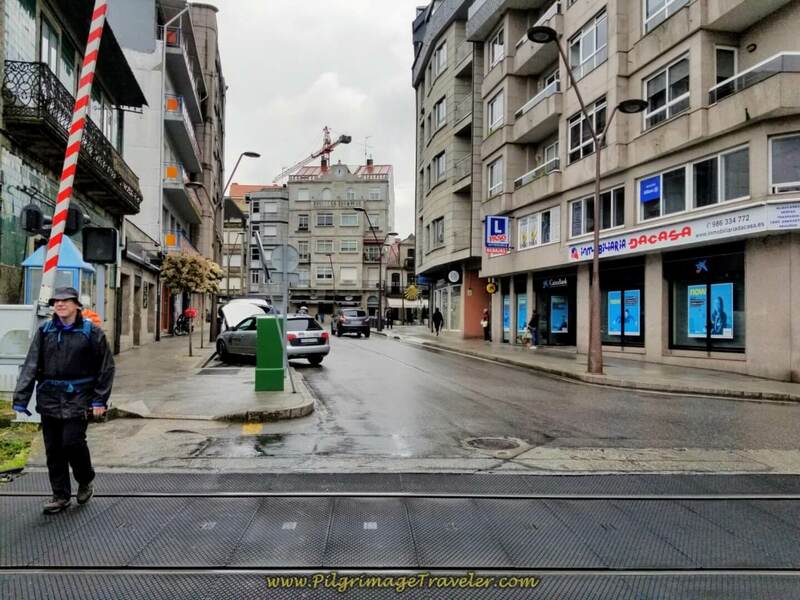 Come to the left turn onto the pedestrian way through the town, pictured below, called the Camiño da Rua. It is a steep climb into this charming village. Here is Rich walking up the pedestrian way, by the town cross. The albergue, not pictured, is on his left shoulder. The albergue in Mos is about 2.34 kilometers from the albergue in Veigadaña. There are several very inviting-looking cafés along this section. I am not sure why we didn't stop here. I suppose we felt we hadn't put in enough kilometers since our last stop. Plus I thought there were many more cafés not far ahead. I thought wrong. 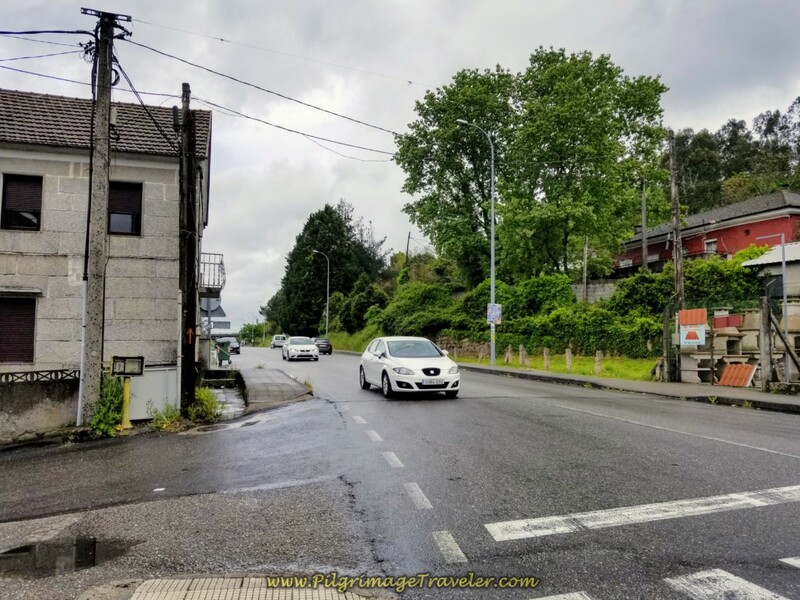 We walked slowly through town, and past the albergue. It is a very charming place in the mountains. Another very practical town to stay in to shorten your day from Tui. 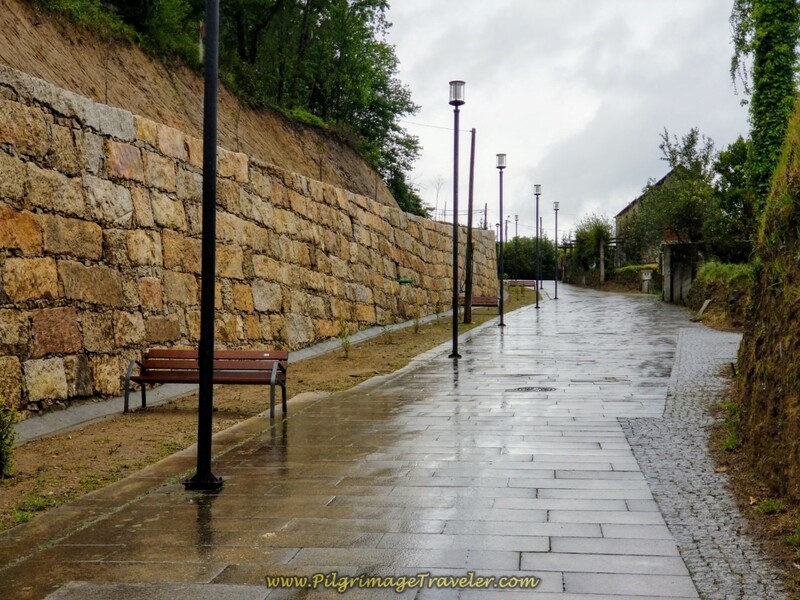 There is a very steep street climb as you leave Mos with lots of benches for resting along the way on the Camiño da Rua. There was no rest for us in the rain! A nice cross and resting area is available at the 92.9 kilometer waymarker, just after Mos. I took a photo, looking back at Miriam and Borut on the steep climb out of Mos. Here is the waymark, almost at the top, at the intersection where the Camiño da Rua joins the Estrada Alto de Barreiros-Santiaguiño. 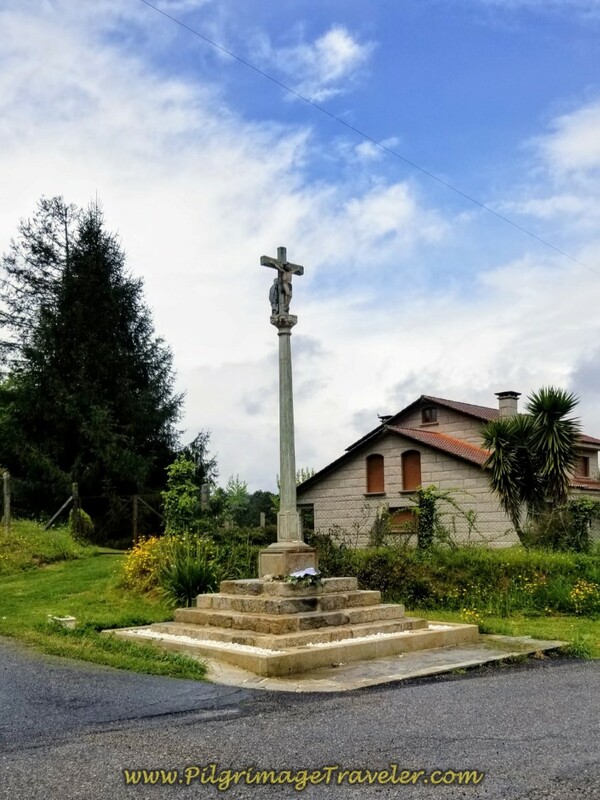 You walk a few more meters on the Estrada Alto de Barreiros-Santiaguiño and come to the top, marked by the Santiaguiño cross, shown below. Lo and behold, there was blue sky above the cross when we arrived! It is just shy of one kilometer from the turnoff in Mos to the high point of day twenty-one at the cross. Relax, breathe and pay your tribute here! It is essentially all downhill for the rest of the day. 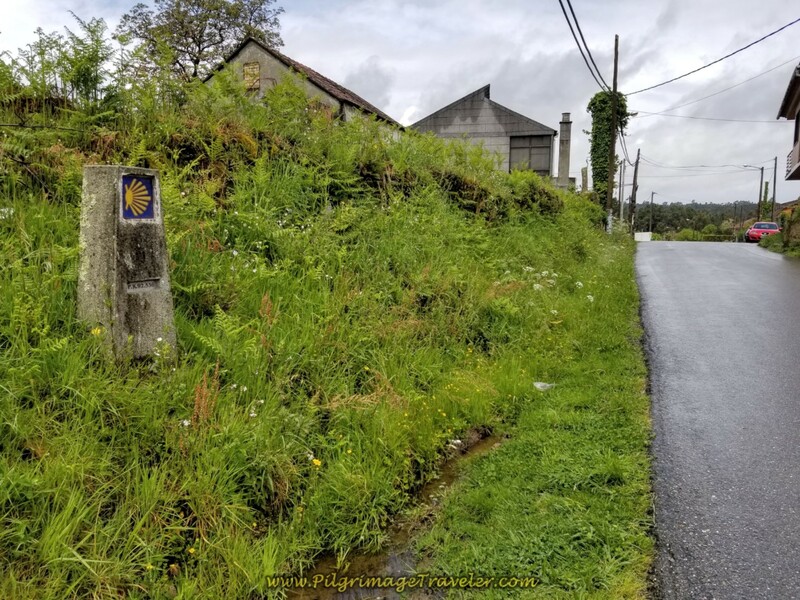 At this point you are about 9.0 kilometers into your day twenty-one of the central route on the Portuguese Camino! Santiaguiño Cross ~ The Top! Continue on the Estrada Alto de Barreiros-Santiaguiño. The Way feels long, flat and straight on this paved road, for another full kilometer through rural countryside that is not very interesting. At least it was downhill for the most part. 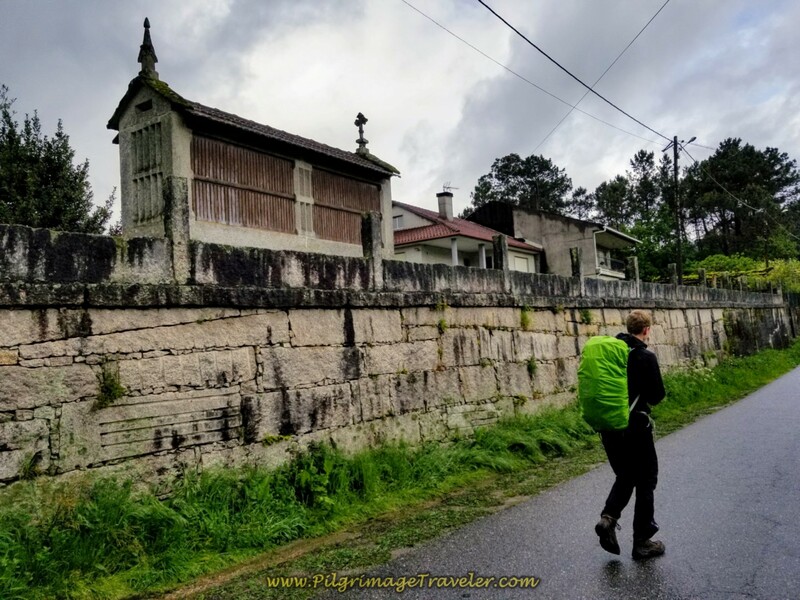 We did walk by our first Galician old-fashioned granary, called an horreo pronounced sort-of like the Oreo cookie) on day twenty-one of the central route of the Portuguese Camino. Leave the Santiaguiño road, after one kilometer, and turn onto none other than a cobblestone road for 1/2 kilometer (not pictured). Who says there is no cobblestone in Spain?? 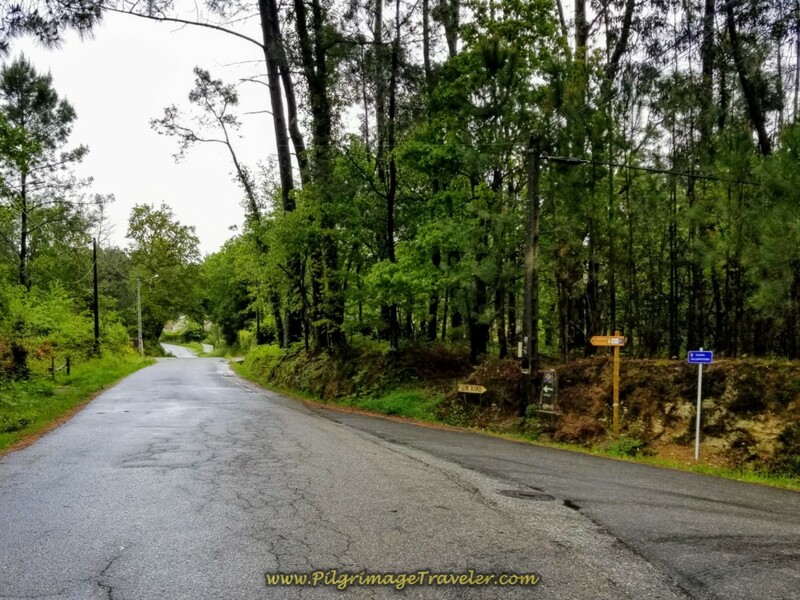 Join the Camino Cerdeiriñas, here and walk up a hill and through a cluster of houses along the road at the Parque Cerdeiriñas. In 300 meters, we joined the Santiaguiño road once again walking on it for only 150 meters before joining a lovely path, one of the few short off-pavement sections, shown below. Walk the path for another 150 meters before joining the Santiaguiño road once again. Walk on this road for another 100 meters to cross a main road towards another path, shown below. It is on this crossroad, that if you turn right OR left, you will come upon a café (consult the map above). We did not know this at the time, and it would have been a great place for us to stop, after about 11 kilometers from O Porriño. Look for the signs to the café Bar Casa Veiga before you enter the pathway. At the corner where the pathway begins there is a sign, shown below, letting you know that the Romans used milestone markers to indicate distances every 1000 passus, or Roman double steps. This was called a Roman mile. Interesting! Look for the marker (it should be made of concrete). I missed it! If you photograph it and send me a copy, I'll send you one of our Ebooks for free! 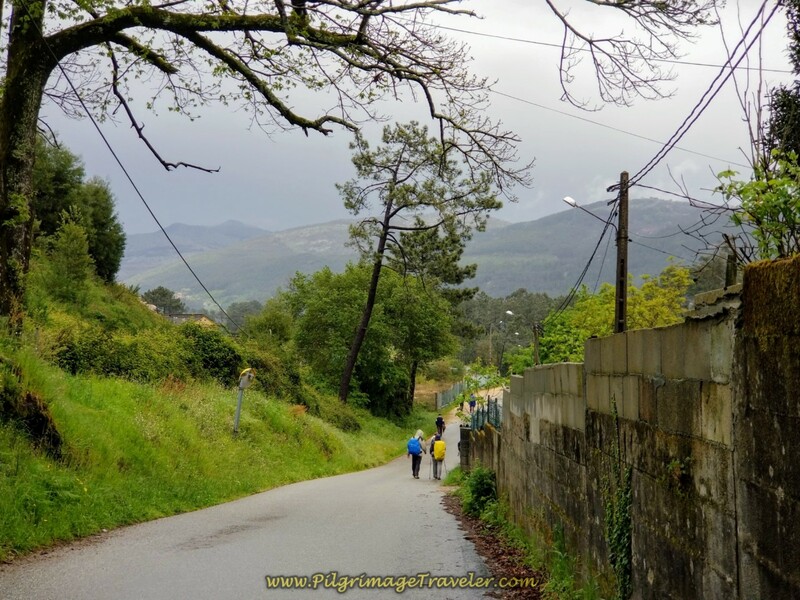 After about 1/2 kilometer on the off-road path we picked up the Igrexa-Vilar Infesta paved road to walk toward the next town of Vilar de Infesta. Here is Magnus, walking through the town. 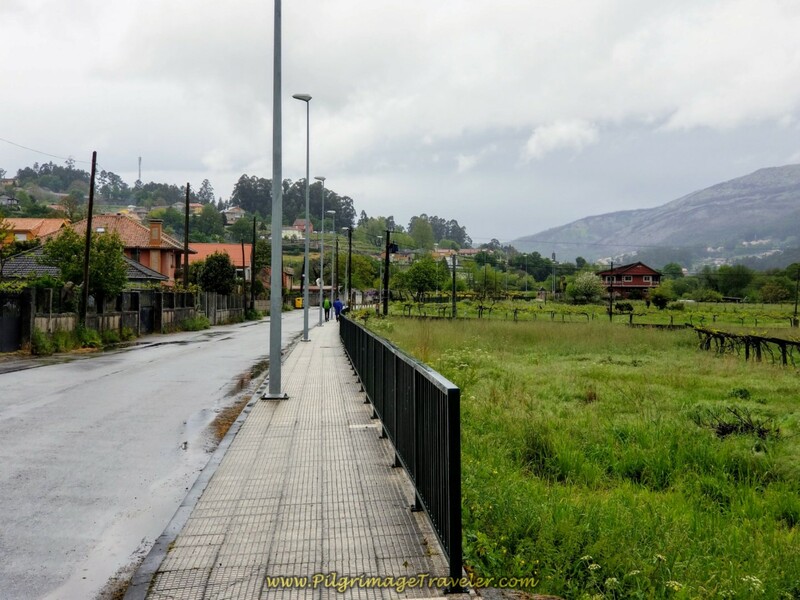 It is a long way on sidewalks, through Vilar de Infesta, about 1 1/4 kilometers. The town is just immediately east of the Vigo airport. 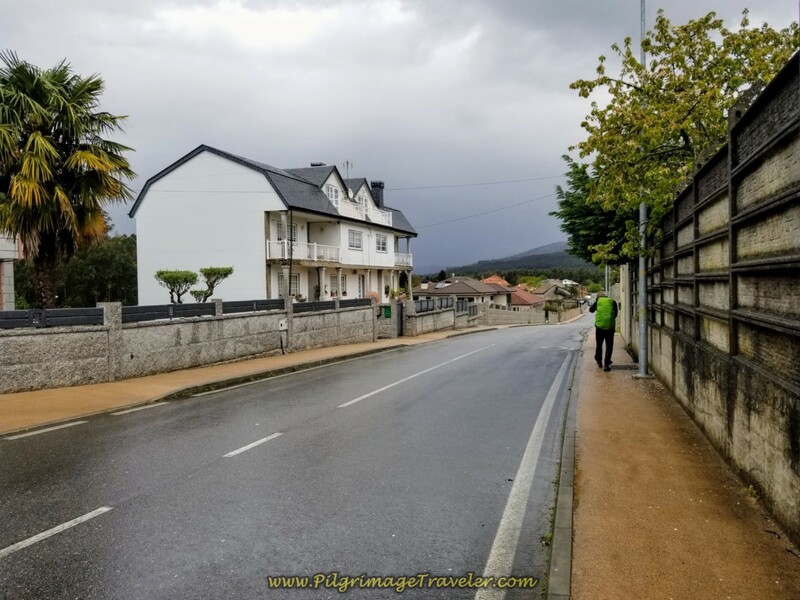 Google maps shows that there are cafés along this road but we did not see any at all on day twenty-one of the central route on the Camino Portugués. Please let us know if you see differently, if we might have missed one! Next, you turn off the road, to the left by the restaurant Churrasquería Choles. It was pouring rain by now and we desperately needed a break. The restaurant was packed out. Not a single table available! It was a Sunday afternoon lunch hour. So, we went back out to the porch where there were a few chairs scattered under the awning. We were told there would be no service here. We dived into our packs for snacks as it continued to rain around us. There were to be no hot beverages. It would just have to do. It was a good thing we didn't try to keep walking. It started to hail heavily a few minutes after we sat down! OMG! Could anything possibly be worse?? I could see the look of despair on everyone's faces. They were a reflection of my own feelings. Fortunately the hail abated as quickly as it came. After about 15 minutes we got up to go on. It was still raining, but our break was actually perfectly timed to avoid the hail! I felt grateful. We trudged on through the rain and wet pavement for 3/4 kilometer after our break. No one was talking much. We just kept our heads down and kept moving. 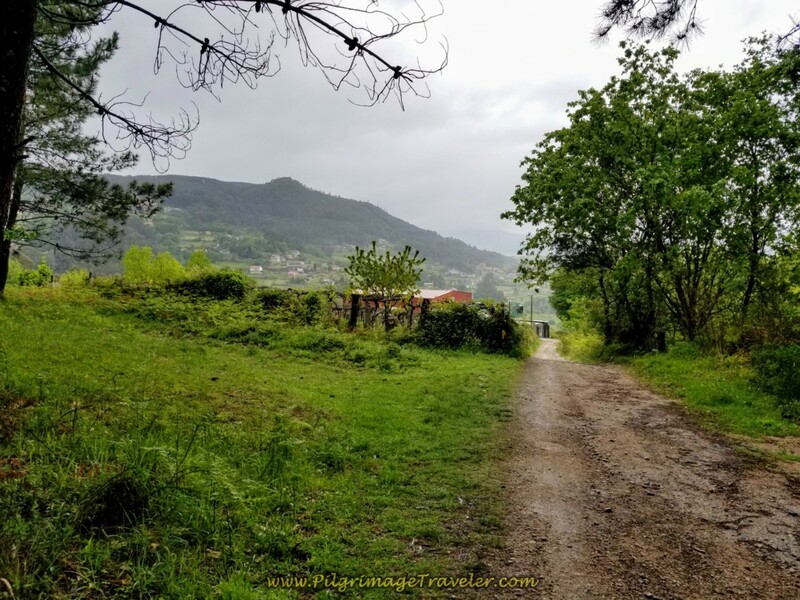 The photos, however still make the Camino beautiful-looking, don't they? We came to a country lane and walked on it for 1/3 kilometer. We could see the steep drop ahead into Redondela far ahead. Almost there! My spirits lifted, but not much! 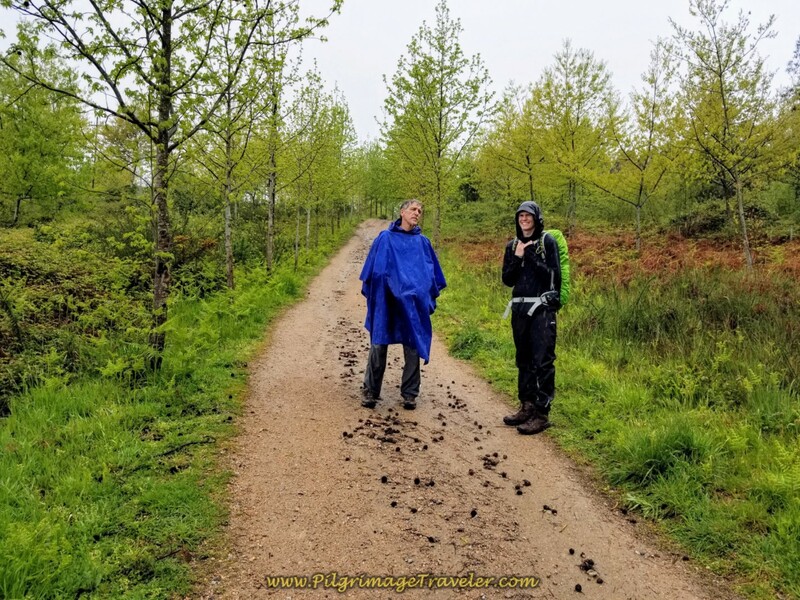 The Way went from mud to rough pavement as we began the ever steeper descent into the next town of Padrón. 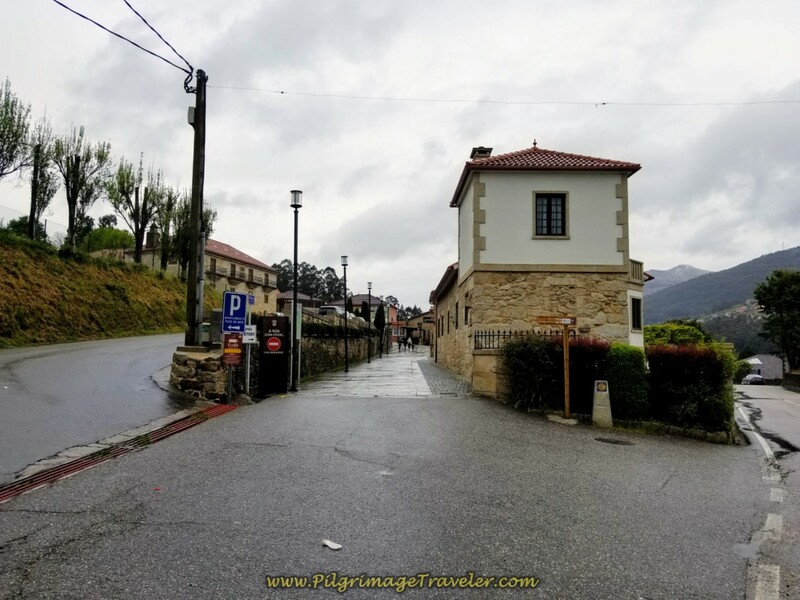 In 100 meters we came to a T-intersection and turned right and in another 100 meters turned left to pick up the aptly named Camiño Romano to walk into Padrón. 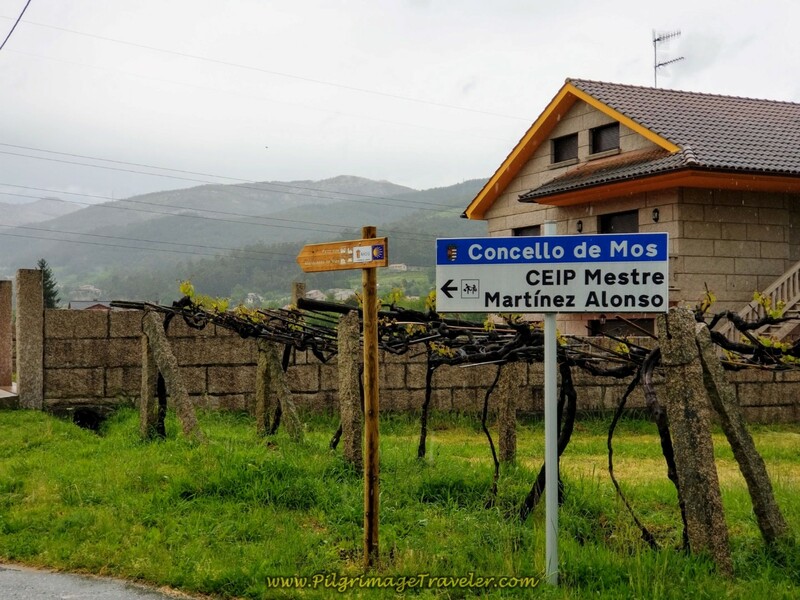 In the photo below you can see the signs for the Albergue and Bar O Corisco ahead. We considered for a moment stopping here for something hot, but since we were so close to Redondela we decided just to get the day over with! 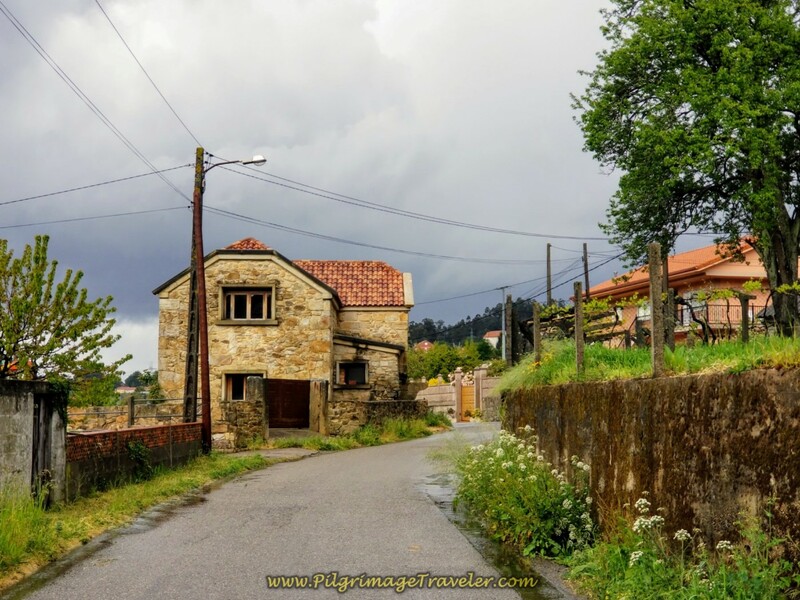 Continue on the Camiño Romano and walk by this country home. You can see the sun was now trying to break out, as the sky tried to brighten, as seen in this photo. Unfortunately, the sun did not break through, despite several attempts. 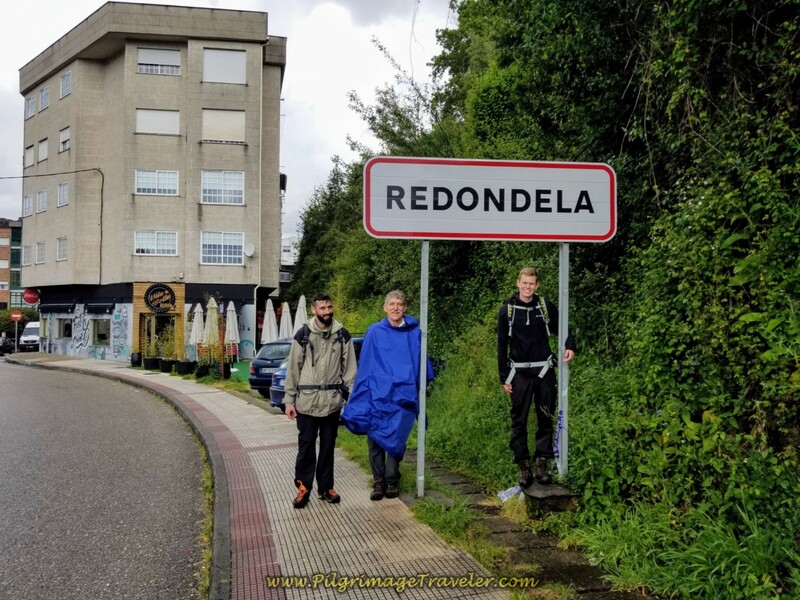 Walk about 3.0 kilometers straight on from the turn onto the Camiño Romano until you reach the outskirts of Redondela, the scenery becoming more and more suburban-looking. Here we are, joining the N-550, just south of the Redondela city limits. This is where Matt, Magdalena and Michal would have come into the city, after doing the entire route from O Porriño on this highway. After about one-half kilometer, turn off the N-550 to the right and onto the Rúa do Muro, where the Redondela sign is before you. We had finally arrived in Redondela. It took all I had to convince the guys to pose by the sign. I'm not sure where Miriam was during this photo, but she most likely was behind a bit, and I had no patience to wait to take the photo. All of us were totally spent. Even the young bucks! The Convento de Vilavella loomed darkly in the dreary light on the other side of the street from us. We walked onward a few more meters to join the Rúa Pai Crespo to walk into the center of town. Along this street we left our friends in front of their accommodation. Matt, Magdalena and Michal had texted us their location, and the rest of our group wanted to quickly join them, have a hot shower and rest. We reluctantly said good-bye to Matt, Miriam and Borut, hoping and planning to meet up in Santiago in a week or so. It was a sad parting. 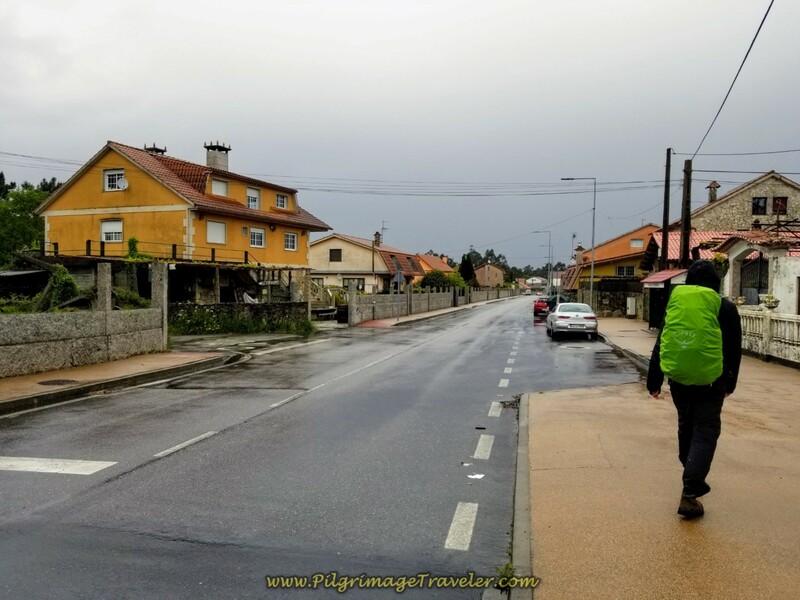 We have no photos of a wonderful communal happy hour or dinner at the end of day twenty-one of the central route on the Camino Portugués. For Rich and I, this was the end of our Camino Portugués. 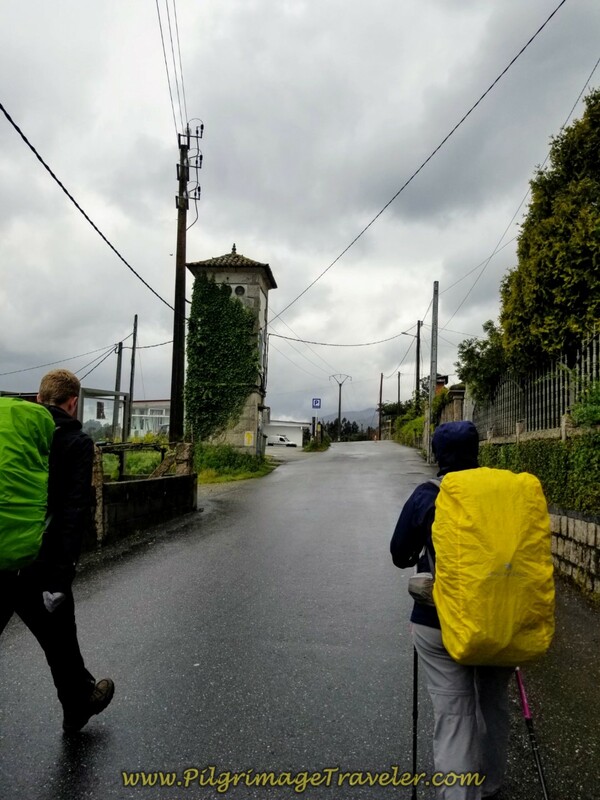 With heavy hearts and heavy feet, we walked the final few meters to the municipal albergue in the center of town where I turned off my GPS, officially completing this stage. 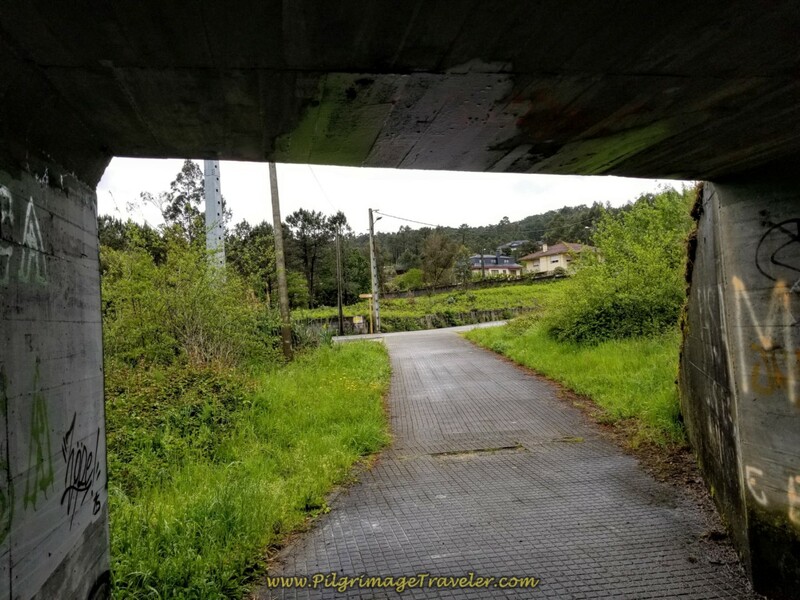 We were headed to the train station to travel to the north coast to start the Camino Inglés. 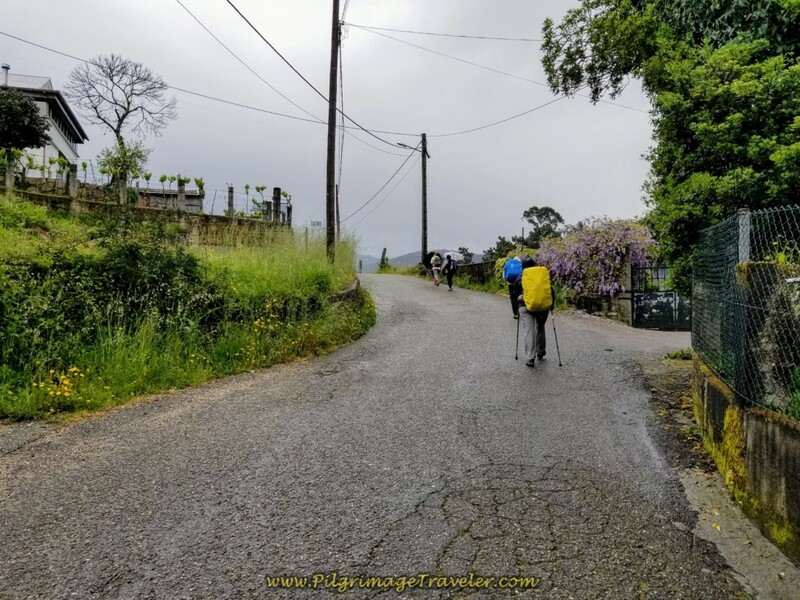 We had done the route from Redondela to Santiago only the prior year, and we were not going to repeat it this year. To see the rest of this route, please click on day twenty-two when we did it prior. If you are looking for Redondela accommodations, click on the link. There are many of them, of all types. Before going to the train station we looked for an open café bar on this dreary, late afternoon. We were horribly hungry. Of course, the whole town was closed for siesta. We finally found an open bar that only had tortilla bocadillos to eat. They filled our bellies. We washed the sandwiches down with beer to ease our pain. 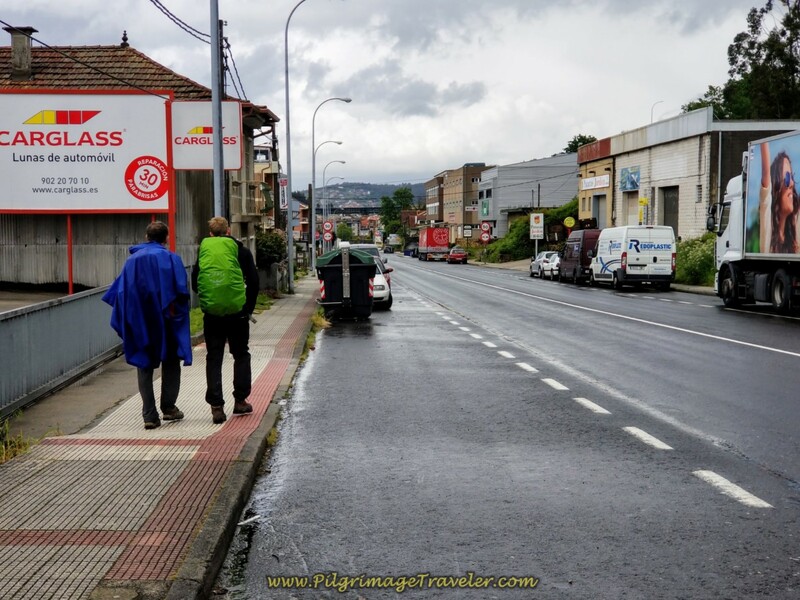 Without a shower and without a rest, we called a taxi for the train station, getting ready for the next phase of our Camino. We would get to La Coruña late that night and we could rest on the train. We would have to wait to shower when we got there. 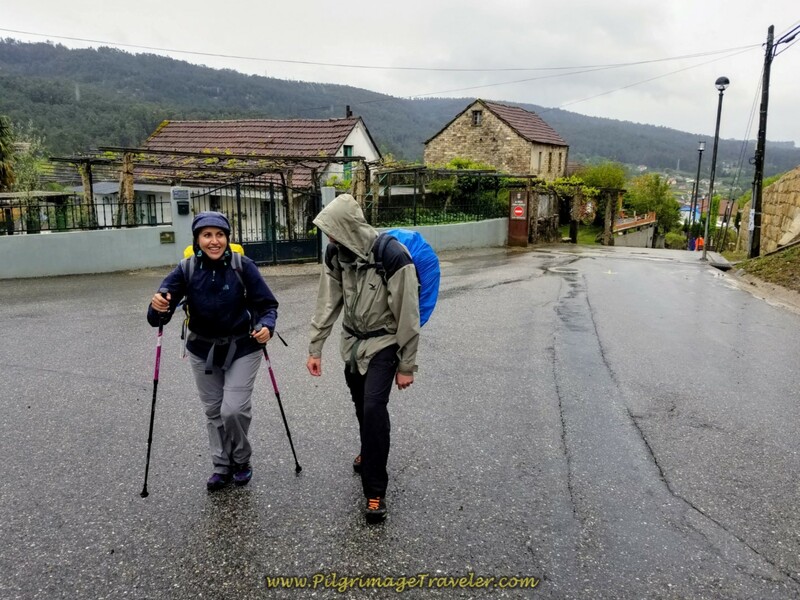 I am almost in tears as I write this, months later, reflecting on the wonderful connections that we made, and how difficult it was to leave our friends in the middle of their journey to Santiago. The weather most certainly reflected our dismal mood. The day was very difficult, as we had combined it with day twenty, to make a very long day in very wet conditions. I would not have chosen this, had it not been for our tight train schedule. In fact, I was even willing to release the money we had already spent for the train ticket, to alter our plans if needed. As it turned out, Team Magdalena prevailed, even though the half with Magdalena went another way. It took quite a bit of digging deep, to get the two days accomplished, for all of us. Despite the difficulty of the long day, I found that I was not as dispirited as usual. I reflected why this was so. There was something a bit more special about this team that we had created than others, and the last six days were very powerfully motivating for me. It really was a very, very special time for the both of us! I was very teary going into our Camino Inglés the next day as I missed our team so much already! I am not a very sentimental one, so this surprised me quite a bit! 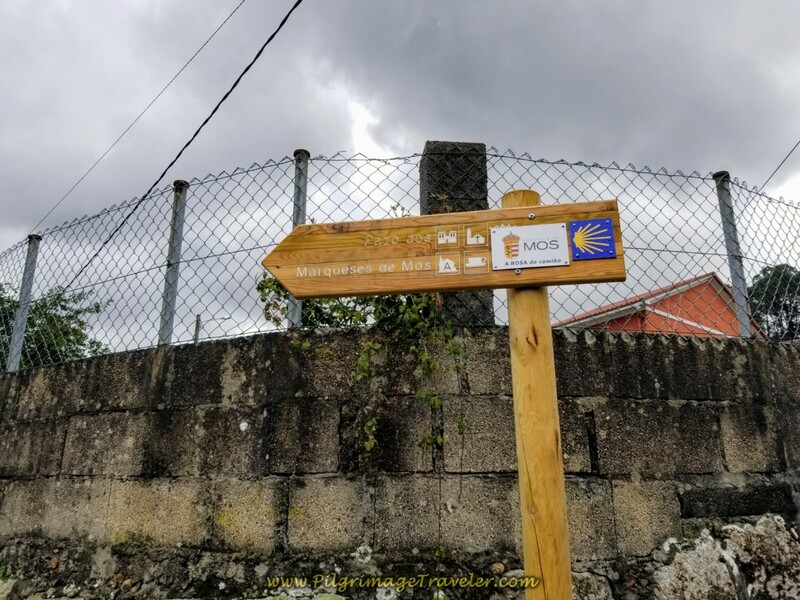 When I had made these plans, many months ago, I did not realize the impact leaving a Camino family would have on us, if separated prior to the finish in Santiago! We were a powerful team together and I wondered later, how this would be replaced going forward. Because of the long day, we did not have time to see Magdalena, Matt and Michal again. They had arrived in Redondela before we did, having taken the shortcut on the N-550. They were resting when we arrived and we did not want to disturb them. It was a terribly long day for all of us. We could only hope to see them later. The good news is that we did at least see Magdalena and Matt again in Santiago, some days later. While the rest of team Magdalena had time constraints and arrived in Santiago several days before the rest of us, Magdalena and Matt had none! They took their time exploring the wonderful cities between Redondela and Santiago and because of it, we were able to connect in Santiago later. 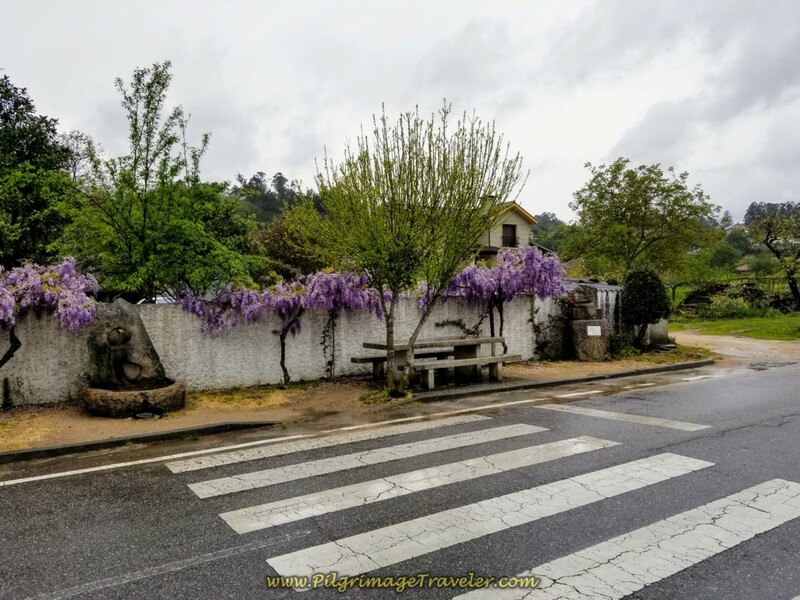 We had a happy reunion in Santiago after we had completed our Camino Inglés, so the story has a happy ending! 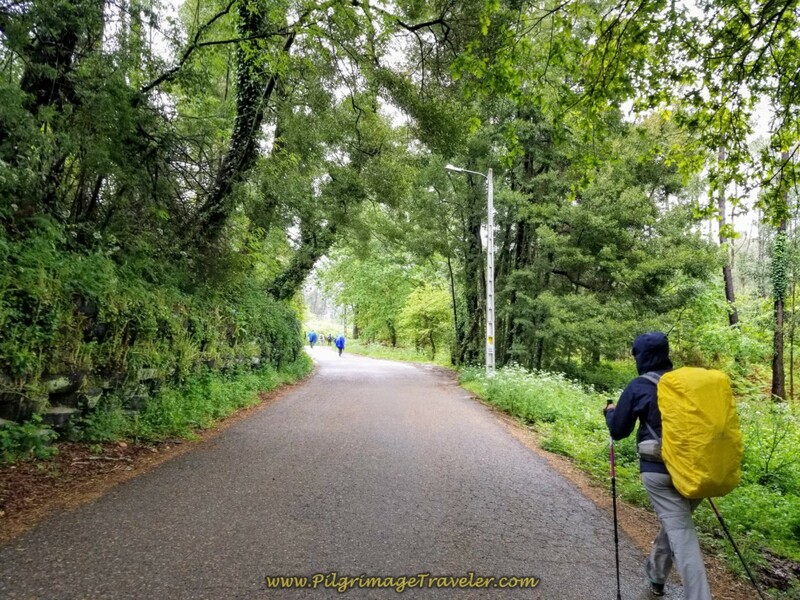 May your own day twenty-one of the central route on the Camino Portugués be filled with persistence and commitment to your personal journey, however that may look for you! Keep going further; Keep going higher… May God help you! E Ultreia E Suseia!